This One of a Kind luxurious 5 bedroom 4.5 bath home seats on a one acre lot in the prestigious gated subdivision in The Oaklands. With very spacious living areas, wide hallways, a big laundry room, beautiful chandeliers & a built-in entertainment system this home will take your breath away. The sleek modern kitchen features a large pantry, top of the line appliances, a built-in refrigerator, plenty of cabinets, a center island with seating, and plenty of counter tops.The master suite cannot get any better...with seating area overlooking the mature trees, the master bath features a jacuzzi and a separate glass shower, double vanity, and a HUGE walk-in closet. In the upper level we will find an office and great bonus room that could be used as a mans' cave, gym, game room etc., with a wet/dry bar and its own private balcony. Possibilities are endless. 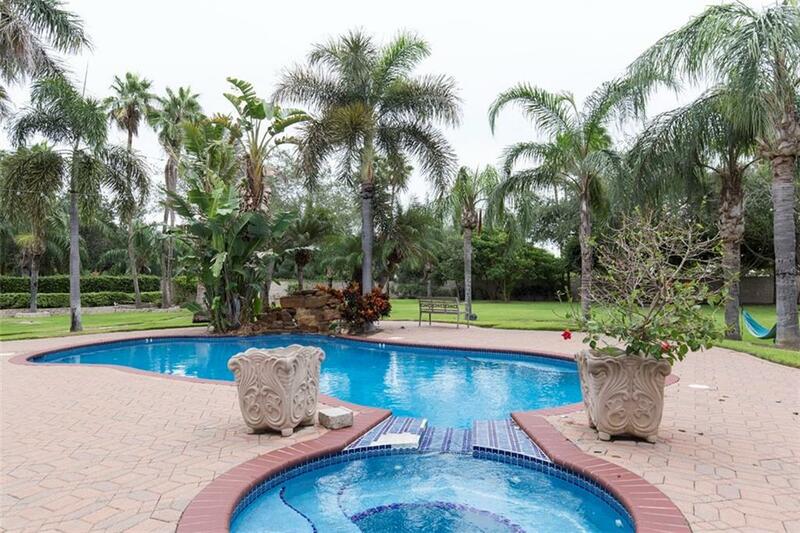 after a long day... relax in this heated pool or hot tub while enjoying the beautiful view of the large yard & mature trees. Listing by Dulce L. Mascorro of Re/Max Elite.